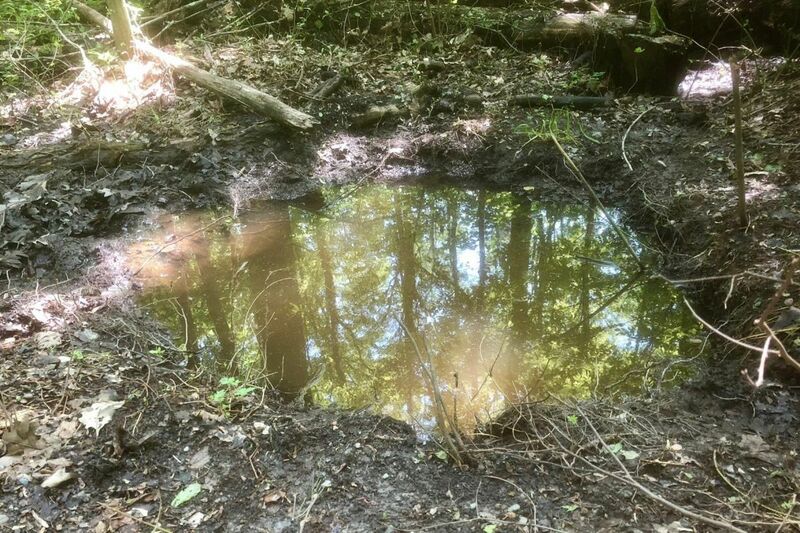 This crater was left behind in Upper Black Eddy, Bucks County, after a mysterious, late-night explosion on May 13, according to nearby resident Nick Zagli. Federal and state authorities are probing a series of these explosions in rural Bucks County. Nick Zagli found himself awake at 4 a.m. on May 13, thrust into the middle of a mystery. A loud, powerful explosion startled him as he sat inside his home in Upper Black Eddy, a rural community in Bucks County cut through by state game lands. "Look, this is a rural area. We all shoot guns and set off fireworks," Zagli, 53, said Friday. "But this? This was different." Zagli bore witness to one of a series of mysterious, late-night explosions in the northernmost part of the county, a full hour from Philadelphia. Reports from at least five adjacent townships have poured in for nearly a month, a volume that this month attracted the attention of federal investigators now lending a hand to the state police detectives assigned to the case. The FBI and Bureau of Alcohol, Tobacco, Firearms and Explosives have offered little insight into the probe, saying only that the blasts don't appear to be natural or the result of construction work. Trooper Mark Allen, the public information officer assigned to the state police barracks in Bethlehem, said Friday that an update will be issued "no sooner than Tuesday with more specific and accurate information." Meanwhile, theories from Zagli and his neighbors, incredulous that federal agents are exploring their communities, run the gamut. Everything from errant asteroids hitting the earth to conspiracies about clandestine miners digging underground tunnels. Zagli's curiosity was piqued further the morning after the blast when, as he was out driving near his home, he found a hole in the earth near the shoulder of Lonely Cottage Road. Debris had been blown onto the road from the crater, about 4 feet wide and a foot deep. He watched that day as state police investigators examined the area, but they didn't offer him any information. Nor did they comment on the issue Friday. Meanwhile, the hole is still there, filled to the brim with rainwater, surrounded by displaced soil. Police in nearby Richland and Springfield Townships referred comment to state police Friday. Previously, Richland Township Police Chief Richard Ficco told reporters that two of his officers had heard the explosions while on patrol, with one witnessing a flash of light seconds before hearing the rumble of the blast. Sue Crompton, a longtime resident of Haycock Township, doesn't know what to make of it all. The sound, she said Friday while taking a break from her midday shift at the Quakertown Family Restaurant, was unlike anything she had ever heard. "It practically knocked me out of bed," Crompton, 52, said. "Your mind goes to meteorites or people making bombs. I just don't want anyone to get hurt." Crompton said she felt an earth-shaking explosion April 30, waves of tremors that rattled the windows in the mobile home she shares with her elderly mother. And she weathered a similar quake two weeks earlier, she said, when she heard two blasts go off about five minutes apart. At the time, she said, her neighbors chalked it up to a blaze at a nearby barn. The more recent explosion changed their minds. "With that rumble? No way," she said. Before her days waiting tables at the suburban diner, Crompton worked on a ski resort in Colorado. Sometimes, she'd hitch a ride up the mountain with the crews as they'd ignite controlled demolitions to stave off avalanches. Even that sound, she said, didn't match these mysterious overnight explosions.